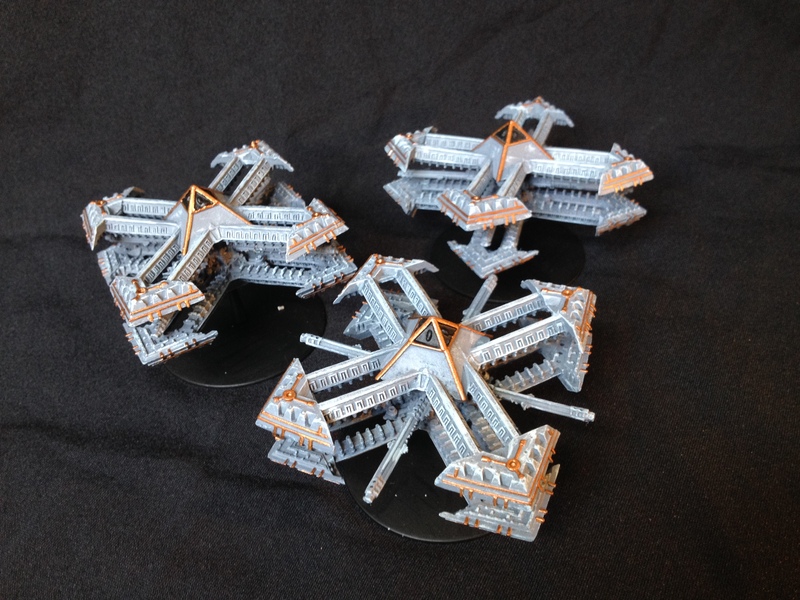 Just another quick post I am afraid – I promise I have some more exciting stuff coming along in the pipework including my first game of 40k in about 9 months, a completely painted Rogue Trader fleet, and surprise fleet! Ooooh exciting, right? 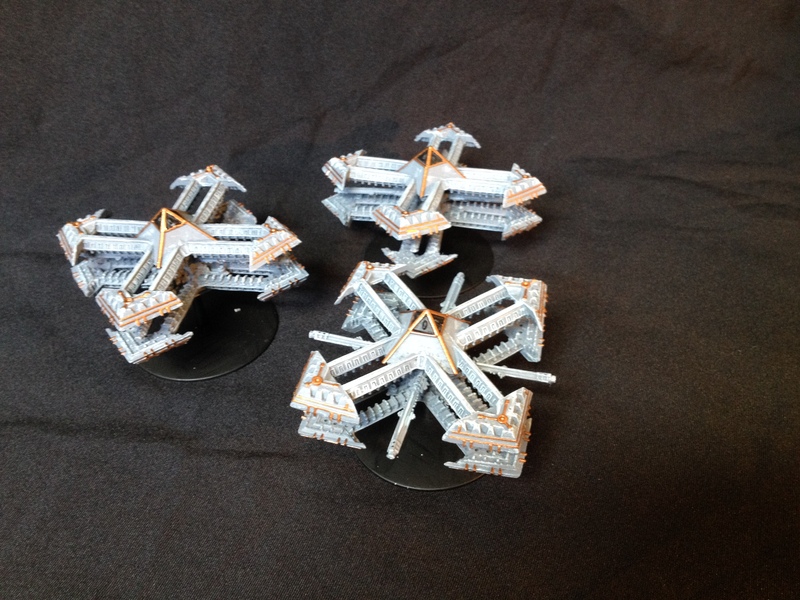 For now though, I give you my recently painted Blackstone Fortresses – these are great big floating things that the Imperium found and repurposed as space defence structures, having guns and fleet repair modules grafted onto them and forming the lynchpin of the defences of the Gothic sector in which Battlefleet Gothic is set. There are six (so I only need three more right?) which were the focus of Abaddon’s attack on the Gothic sector. The thing is, while the Imperium may have thought they were just big floating rocks, they were actually a giant superweapon with the power to destroy stars…. Ironic huh? 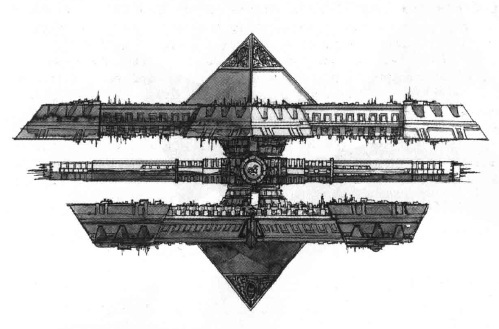 Abaddon eventually captures three of the six Fortresses and tries to withdraw to the Eye of Terror – one is detroyed on the way by the Imperium – while the three left in the Imperium’s hands self-destruct. So six, minus 3 (imperium), minus 1 (detroyed by Imperium) makes 2 left floating about in the Eye of Terror somewhere! They make for a great centrepoint to narrtive scenarios and can be employed as planetary defences in the core rules too, making them useful models to have in a wider collection. They are also not that rare and pop up on eBay fairly regularly for around £25 each. Of course their use is not limited to just the Gothic Sector and they work well as generic space stations or system bases. The two left over even reappear in the timeline, 800 years later, supporting Typhus and his Plaguefleet in the 13th Black Crusade. More about the Gothic War and the Blackstones can either be found in the BFG Rulebook, the Execution Hour / Shadow Point Black Library books, or on Lexicanum. Next post40K – Yes, I actually played a game!